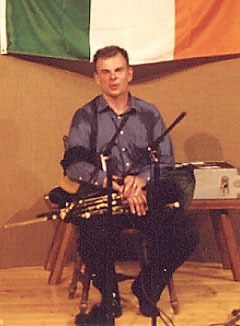 Jerry O'Sullivan is an Irish-American musician who plays the Irish bagpipe (the uilleann pipe - pronounced ill-in), as well as the highland bagpipes, Scottish border pipes, flute and whistles. I saw him play recently at the Coatesville Cultural Society, in Coatesville, Pennsylvania, for the Coatesville Irish Traditional Music Series. 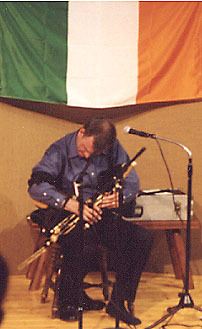 Besides being a master piper, Jerry is also very interested in educating the audience about the instruments, as well as the history of Irish traditional music. Growing up in New York City, with frequent visits to Ireland, Jerry is very knowledgeable about the Irish music culture and individual musicians. 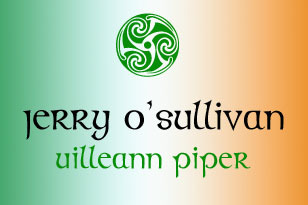 His latest CD is called O'Sullivan Meets O'Farrell, in which Jerry has brought back 18th century compositions by the Irish piper O'Farrell, which had been lost to audiences for a long time. Jerry kicked off his left shoe soon after he started playing; it seems he can keep time and feel more comfortable at the same time! 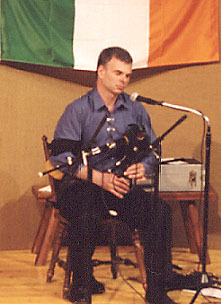 The uilleann pipe is played with a bellows with his right arm, rather than with the mouth, as highland bagpipes are played. (In the Irish language, uilleann means 'elbow'.) Jerry showed the audience the various parts of the instrument, which is considered very difficult to play, sometimes being uncooperative. The bag is located under Jerry's left arm; all in all, both arms and hands are kept very busy!